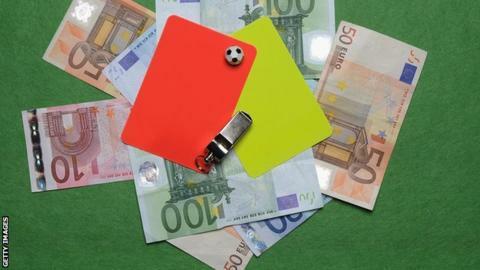 A European treaty aimed at tackling match-fixing in football is to be introduced. Sports ministers from across Europe will meet in Switzerland on Thursday to announce the pact, which contains a series of measures. An alert system triggered by suspicious bets will be set up, and international co-operation will be improved. Protection for whistleblowers will also be strengthened, while offending bookmakers may have cashflows blocked. The treaty, a convention against the manipulation of sports competitions, already has the backing of 12 nations. It has been created by the Council of Europe in response to a surge in the number of reports of illegal activity, including match-fixing. John Abbott, who is leading an initiative between international police agency Interpol and world governing body Fifa to reduce corruption in football, told BBC Sport earlier this month he had seen "a rapid increase in reports of alleged match-fixing" around the globe. He alleged the practice is "being driven by professional criminals, exploiting betting markets, whether they are legal or illegal". In June, three men - Chann Sankaran, Krishna Ganeshan and Michael Boateng - were jailed after being convicted of plotting to fix the results of lower-league English matches. They were found to have paid footballers in order to influence the outcome of matches so that others gambling on the action could profit. Could World Cup matches be fixed? Read more on Fifa World Cup 2014: Could matches be fixed in Brazil?